Thank you for visiting Custom Garage Works! 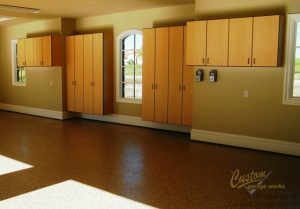 Known for our custom garage floor coating in Seagoville, TX, we originally began our business in 2003. We set out to create the perfect garage for ourselves and our growing families, but when we could not find what we were searching for within the current industry, we made the decision to jump in ourselves. Now, we proudly provide professional garage storage solutions, along with top-of-the-line polyurea polyaspartic floor coatings, that have a significantly longer lifespan than epoxy. We are dedicated to excellence, and we love providing premium garage floor coating and custom garage solutions throughout the DFW area. 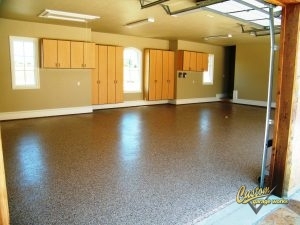 Our custom garage floor coating in Seagoville, TX is one of our most popular garage services! This is because our polyurea polyaspartic coatings create a superior finish that remains for decades. While with epoxy floor coatings, you have to avoid UV exposure and watch out for flaking, our polyurea-based floor coatings are much more durable. In addition to our floor preparation, which incorporates professional diamond grinding, instead of acid etching, you end up with a showroom quality floor that is simple to clean, and practically indestructible. If you’re interested in hearing more about our garage floor coating service, please schedule your free estimate when you call 214-494-9068 or 817-308-1305. Garage Floor Grinding Our diamond grinding technique will help you get the optimum surface to adhere your floor coating to. Thanks to Custom Garage Works’ storage solutions, you won’t ever need to be concerned about running out of space in your garage again. The greatest custom garages have an organization system in place. To address the unique organizational needs of our clients, we offer a selection of different organization products, including overhead storage racks and cabinets. Unlike other business, our storage racks are designed for heavy duty storage, and our garage cabinets are designed specifically for use in garages. When you need a resilient garage floor coating in Seagoville, TX, and unmatched organization solutions, you can depend on Custom Garage Works. Overhead Storage Racks If you want to get more out of your overhead storage space, our durable storage racks are a fantastic place to start! Storage Cabinets Unlike kitchen cabinets, ours are designed specifically to let you get more from your garage storage! And More! We offer a extensive selection of garage organization resolutions to our clients, to provide the optimal custom garage!